1. The magnetic separators are used for concentration of α hematite(including specularite), limonite, siderite, manganese, chromite. 2. The roughing and concentration of ilmenite. 3. The strong magnetic work of all kinds of weak magnetic ores with comparative high content of strong magnetic ores. 4. The recycling of weak magnetic ores in overflow of mineral processing of hematite and limonite, ilmenite, manganese. 5. The removal work of weak magnetic ores in nonferrous metal ores such as cassiterite and rutile. 6. The removal work of weak magnetic ores in feldspar, quartz sand, kaolin, zircon and eremite. 1. The magnetic material of the magnetic system all use good quality neodymium iron boron, which have high magnetic energy product, strong coercive force and high magnetic flux density, the effective separating surface has strong magnetic induction. 2. We use pure magnetic materials electricians using as magnetic media, and use multilayer induction poles design, the magnetic field has high gradient. 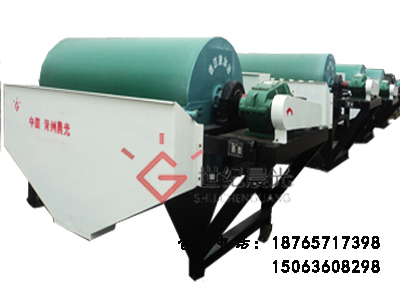 The magnetic separators are suitable for the magnetic separating of fine grain grade, micro fine grain grade ores. 3. The magnetic separators have affective ore unloading design, ensuring the equipments can work continuously and normally in a long period when there is a little sum of strong magnetic materials in the elected materials. 4. The ore pulp and effective work surface have big touch surface, which increase the catching probability of weak magnetic ores effectively.